There are companies making CBD-infused well, everything. If you have read any of my other reviews, you know I’m a fan of CBD. I’ve tried many CBD from many different companies and in different forms, from tincture to gummy. Like anything else, some you like and some you don’t. I was recently sent a line of CBD products from Every Day Optimal and I was excited to give them a try. 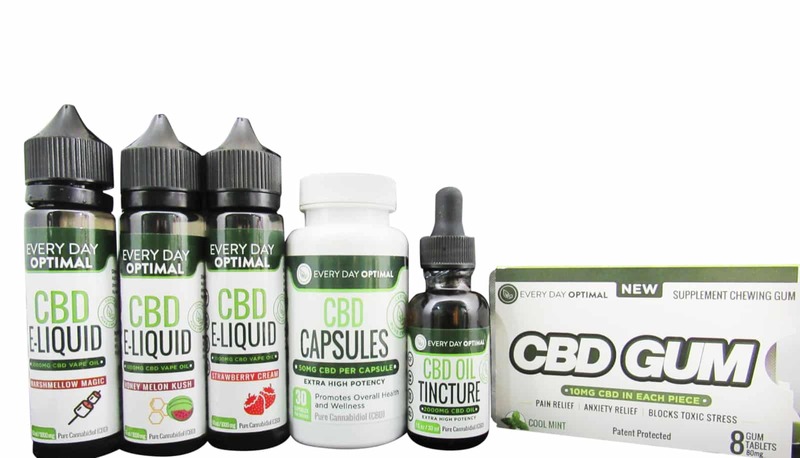 I was sent Every Day Optimal CBD Gum, CBD Oil Tincture, CBD Capsules and three flavors of 1,000 mg CBD E-liquid. I’ll admit as soon as I opened the box, I popped a piece of Every Day Optimal CBD Gum in my mouth, just to give it a try. It’s Cool Mint flavor and boasts 10 mg of CBD per piece. It has a thick texture (almost like a vitamin supplement or something of that sort) and a good minty flavor. The strong burst of flavor of the Every Day Optimal CBD gum didn’t last too long but it was still chewable. While the overall experience was pleasurable (I mean, who doesn’t like chewing gum? ), I did not notice any of the calming or relaxing effects from CBD that I normally do. Perhaps the 10 mg was too little for me and may be very effective for other people. CBD is one thing you must play around with what potency you use, even with the same brand. Different levels, in different formats, may impact you differently. The Every Day Optimal CBD Gum didn’t wow me, but that doesn’t mean it won’t wow you. Selling for $24.99 for eight pieces, I would have to say I won’t be buying more, but I appreciate the opportunity to try it. Every Day Optimal CBD gum. Onto the Every Day Optimal Capsules. With 50 mg of CBD in each capsule, it’s just too easy. I love an easy delivery of CBD and being able to swallow a capsule is just about as easy as it gets. With Every Day Optimal Capsules, I did notice some CBD calming about 30 minutes after I had taken it. Overall, I was impressed with this product. A bottle of 30 capsules sells for $119.00, which I found to be rather high for what you are getting. But again, the ease of use and just being able to swallow a capsule to get CBD relief may make the price worth it to you. The capsules are available in a variety of strengths, from 10 mg to 50, with an equal variety of prices. If you’re shopping for capsules, give Every Day Optimal a look. Now let’s talk Every Day Optimal CBD Oil Tincture 2,000 mg. I’ll admit, I do not, as a rule, like tinctures. They normally taste awful but do take quick effect. Tinctures are placed under the tongue and held for a few moments to a couple of minutes. When it tastes bad, this process is just gross. I was really impressed with the taste of Every Day Optimal CBD Oil Tincture 2,000 mg. It is one of the few that I’ve tried that really don’t have a taste. I’ve had to gag them down in the past, but the Every Day Optimal CBD Oil Tincture went down smooth. Best part? Awesome CBD affects within about 30 minutes. I was more relaxed and could feel my frayed nerves calming some. Every Day Optimal CBD Oil Tincture comes in a variety of strengths, from 300 mg to 4,000 mg. I found the 2,000 mg to be a very good strength for me, but as I stated earlier, CBD is going to impact every person differently. Use some trial and error and see what works for you. I always recommend starting low and working up, versus starting high and working to a lower level. Every Day Optimal CBD Oil Tincture 2,000 mg sells for $169.99 for a 30 ml bottle. That sounds high, but keep in mind that when you are only using a dropper worth, as needed, that 30 ml bottle is going to last quite some time. To me, I’d say the Every Day Optimal CBD Oil Tincture 2,000 mg is worth the price, because it worked for me. Onto Every Day Optimal CBD E-liquid 1,000 mg. The Strawberry Cream flavor? Oh, it’s lick your lips yummy, like a good dessert. The Honey Melon Kush, sweet and smooth, like a taste of summer. The Marshmallow Magic? Sweetness in a bottle. Don’t get me wrong, these are sickenly sweet flavors, but deliciously sweet flavors. I was impressed with all the flavors. I’m a big fan of flavored CBD e-liquid and I keep a tank dedicated to flavored CBD. I can tell you, the Every Day Optimal CBD E-liquids will be occupying that tank for some time to come. In addition to being delicious, they are also effective. The CBD in them does what CBD does and was an altogether pleasant experience. Every Day Optimal CBD E-liquids come in two strengths, 300 mg and 1,000 mg. I was pleasantly impressed with the 1,000 mg and at $89.99 for a 60 ml bottle, I can tell you that I’ll be buying more. I know $89.99 sounds like a lot for a 60 ml bottle of e-liquid, but in the world of effective CBD oil, it’s a pretty good price. Bottom line, if you’re looking to try CBD for the first time, or if you’re looking for something new, I would recommend checking out the Every Day Optimal brand. Overall, I was impressed with the products I tried. Some were more effective than others, but that’s true with pretty much every company I’ve tried. Previous articleChicago Increases Vape Tax By How Much? !